The cooperative activity served to deepen scientific contacts between German, Moldovan and Ukrainian universities. 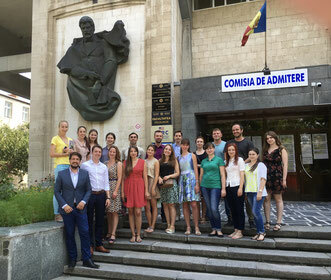 The Summer School was conducted at the State Pedagogical University "Ion Creangă" in cooperation with the LMU Munich. Project team: Dr. Christoph Schnellbach, Sebastian Schäffer, Iris Rehklau. The project was funded by the DAAD. The project aimed to develop future scenarios for the political and ethnographic development of the region with respect to frozen conflicts. In the first part, the foundations for joint work on the project were laid in an intercultural workshop. Since the participants have been influenced in different cultural contexts this segment contributed to a better understanding of the differences and similarities. In the second part, an overview of the current frozen conflicts in the postSoviet area was given. The participants were informed about the different aspects and challenges of conflict resolution. The regional focus was on the conflicts in Transnistria and Eastern Ukraine, extended by conflict analysis from Central Asia and the Caucasus. Both causes of conflict and prevention mechanisms were discussed in those sessions. Each of the discussed conflict was examined by taking into account historical, social, political and regional factors. Through the expertise of the speakers from the respective regions, the local conditions and the international circumstances (including the options for action of the European institutions) could be taken into consideration. At this stage, also the European Neighbourhood Policy was explored, notably with regard to the prevention and resolution of regional conflicts. In the third part, then future scenarios for the frozen conflicts were developed by the participants under the guidance of the lecturing team.